Team Chennai Singams, captained by Suriya, emerged triumphant at the Star Cricket tournament held in M A Chidambaram Stadium at Chepauk in Chennai on Sunday. The day-long journey was packed with fun and excitement and it was organised by the South Indian Artistes Association (SIAA/Nadigar Sangam) to raise funds to construct its own building. Superstar Rajinikanth inaugurated the tournament by putting the toss (which itself was won by Chennai Singams), while Kamal Haasan was the special guest at the closing ceremony. Besides stars from Kollywood, their counterparts from the neighbouring industries were also present. Notable among them were Balakrishna, Venkatesh and Srikanth from Telugu cinema and Ambareesh from Kannada. 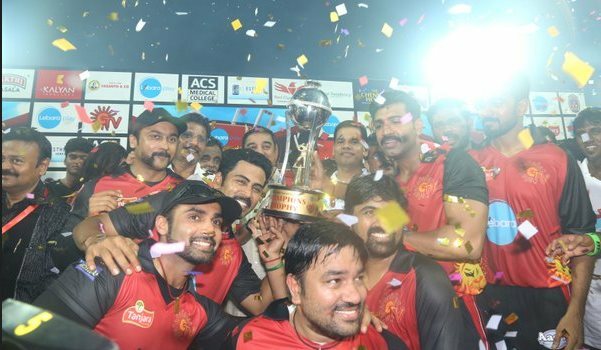 The eight teams which played the game were Chennai Singams (led by Suriya), Madurai Kaalais (Vishal), Kovai Kings (Karthi), Nellai Dragons (Jayam Ravi), Ramnad Rhinos (Vijay Sethupathi), Thanjai Warriors (Jiiva), Salem Cheetas (Arya) and Tiruchi Tigers (Sivakarthikeyan). The cricket event was held to generate funds for construction of its own building for the SIAA in busy commercial district of T Nagar in Chennai. The building project, for which efforts had been made for a long time, ran into a controversy when the former SIAA office bearers signing an agreement with city-based realty developer for construction of a complex. After the new office-bearers were appointed, the agreement was cancelled and it was decided to conduct a cricket match in which the proceeds would go for the construction of the building for the association. On the flip side, some fans trolled the event in the social media, stating that there was little response for the tournament as the audience were less in numbers.